Over the years, lighting in homes has evolved. In fact, many homes in this day and age boast , and innovative dimmers, magnificent and unique foyer chandeliers and even dazzling underwater pool lights. 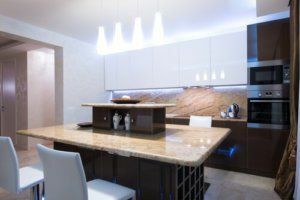 Whether you want to actually see that book you are catching up on or boost your home’s overall resale value, there are endless choices when it comes to smart lighting design ideas. For starters, the general “rule of thumb” is to feature at least one light source for every 100 sq. ft., according to HomeAdvisor.com. However, the needs of each room in each home obviously can vary. Kitchen – This room requires a combination of general and task lighting, especially because it is usually a multi-purpose room. Recessed lights can work well, but remember to add other light sources for specific areas. For example, in addition to hanging stylish fixtures over your table and island, consider installing lights underneath overhead cabinetry to shed light on countertops when cooking or baking. Additionally, remember to add a small lamp to your kitchen’s desk or work area. Living Room –Because various nooks and crannies tend to get lost in the dark in this room, recessed lighting is a must in this area of your home. Be sure to include reading lamps on each side of the sofa, and spotlight bookcases or precious artwork. And if a fireplace is the focal point of the room, try “up-lighting” on either side or “down-lighting” the mantle for a dramatic effect. Bedroom – Similar to the kitchen, a bedroom requires a mix of ambient and task lighting. Consider using track or recessed lighting, and bedside lamps for reading. Also, think about incorporating recessed lighting into the closet, where it won’t take up space in an already limited area. Bathroom – Most bathrooms lack sufficient lighting. Instead of the typical overhead light/fan combination, consider a mix of ambient lighting, lights near the mirror, as well as lighting over the shower or bath. And for mirror fixtures, place them near eye level on either side. An added light source: Consider installing a skylight. Transform your house into your dream home with our custom renovation services in Phoenix. Contact Republic West Remodeling today for the highest quality luxury home remodeling. We proudly serve Scottsdale, Phoenix and the Phoenix Metro area.